No stranger to new platforms after hitting iOS and Android last year, Microsoft's Cortana AI is coming to another atypical location: the top of your Android phone's lock screen. Cortana on Android has been updated to allow access to the Halo-inspired digital assistant and its feature over your smartphone's lock screen, meaning information such as your schedule, reminders, and weather forecast can be pulled up in a snap without having to input an unlock code or fingerprint scan. 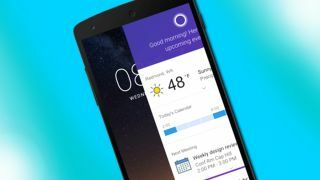 In addition to placement on top of the Android lock screen, Cortana is also getting a slight design tweak to make the service's apps and widgets more streamlined on mobile devices. While Cortana is mostly synonymous with Windows 10 PCs, Android and iOS devices aren't the only branching-out points planned by the Microsoft-powered assistant. BMW and Nissan both plan on bringing Cortana to their vehicles, providing drivers with some digital assistance from behind the steering wheel. This also provides some healthy competition to the likes of Apple's long-standing Siri, Amazon's ever-growing Alexa, and Samsung's freshly announced Bixby, destined for the soon-to-be-announced Galaxy S8. Cortana vs. Siri: Which digital assistant rules the desktop?